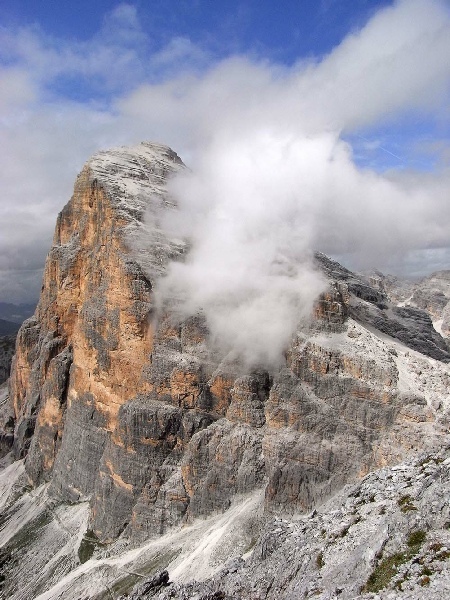 The latest visit to the Dolomites was focused on climbing the 1st, 3rd and 5th highest peaks in the area, namely Marmaloda, Tofano de Mezzo and Civetta. All these peaks have very high quality via ferrata routes to their tops and need serious mountain days to successfully complete them. Further photographs are available here. A DVD of the climbs is also available. This route is two via ferratas combined into one, the lower part is the Punta Anna Via Ferrata and the upper part is the Gianni Aglio Via Ferrata. Both are high quality via ferratas and the route ends on the summit of Tofana di Mezzo - the 3rd highest peak in the Dolomites. We were really looking forward to this day with high expectations for the views and climbing situations, with a reported fantastic level of exposure making this a great all round mountain day. We wanted to get the cablecar from near the summit of Tofana di Mezzo back down since we didn't fancy the long steep descent route. With this in mind, we got to the start early in the morning to catch the first cable car of the day. This was the two-stage chairlift from 'Pietofana'. We arrived at Rifugio Pomedes and took in the impressive route before us. During the short walk to the start of the via ferrata we met a guided group of Italians descending with the ominous warning from the guide that the weather looked bad. We got to the start, thought the weather would hold out long enough for us to complete the route and put on our gear on ready to go. The route commenced by climbing up left towards the ridge. The rock was clean and the protection good and we both started to really enjoy the climbing. The route held the crest of the ridge right up to the summit of Punta Anna. The weather was holding and we had broken views of the neighbouring peaks, especially the nearby Tofana de Rozes. The top of Punta Anna was reached after a couple of hours and we went onwards with the summit of Tofano de Mezzo now in view. The route turned into an easy scramble and we soon reached the narrow deep gap called the 'Torri Gianni wind-gap'. with a rope protected earth ridge spanning the gap. On the other side of the gap the climbing got very steep with the crux of the route being a strenuous and extremely exposed traverse around a nose of rock. After this section, the difficulties eased with some ledge walking but we missed the 'Bus de Tofana' archway in the ridge completely. The route then continued up through a series of twisted old iron avalanche barriers and then some ladder sections towards the top. The summit was only as short walk away now and we finally stopped for a very welcome lunch break. The mist had now closed in so we did not see the views. After a wonderful coffee in the cafe at the top of the cablecar we got our return lift down just as the weather broke with a torrential downpour! What attracted us to this route was it's alpine / mountaineering aspect, something that we really appreciate. 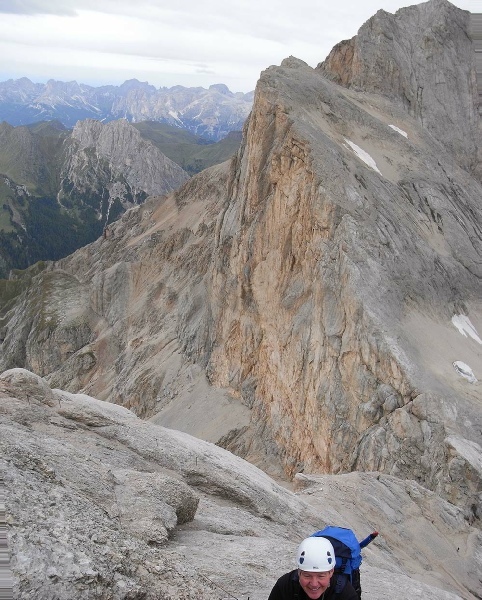 The route climbs 1650m and finishes on the summit of the 5th highest peak in the Dolomites, Monte Civetta. . We decided to break the route up into two days with an overnight stay at a Rifugio Coldai. In the end we spent a further night in the Rifugio on the descent as well. The route started in the town of Alleghesi Only the first stage of the 2-stage Alleghesi chairlift was operating so we had to hike up trails some of the way towards the Col dei Baldi. Trail 556 was followed steeply up the flank of Cima Coldai arriving at the scenically located Rifugio Coldai in the late afternoon sun. 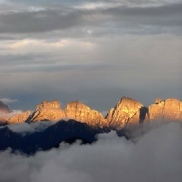 After a good night in the refuge, trail 557 was started the next morning, with the route traversing below the towers of the Civetta's northern sub-peaks. The start of the via ferrata was reached after about an hour and a half of walking and with fine rain falling a decision to go up or turn back had to be taken. We decided to set out on the climb and see what it was like. The lower route looked quite steep from a distance, but it was actually not too difficult with plenty of aid throughout. Even though wet, the rock was extremely grippy. The crux of the climb was a chimney section towards the top of the initial face but this was easily scaled in the end. After 700m of climbing, the main ridge of the Civetta was reached. From this point on the angle of the route eased. When the mist cleared, we were treated to good views down the massive sweep of the 1000m West Face of Civetta. The summit was finally reached and the "visitors" book duly signed. Surprisingly, evidence from the book would indicated there had been very few British climbers on the summit in recent months. Unfortunately, views were limited to the western flank of the mountain by the thick mist. From the summit, the Via Normale descent route was followed past the Rifugio Torrani. The mist had really closed in now so it took a considerable time playing "dot to dot" with the red way marks to ensure we did not go off route. The route included a considerable amount of wire assisted descent which was very much appreciated. After a section of scree, the junction with trail 557 was reached and at this point we stopped for food. Time was getting on so it was decided to head back to the refuge and spend the night there rather than ending up back at the car in Alleghesi at a very late hour. We traversed below Civetta's peak stunned by the views of route we had just completed. Back at Rifugio Coldai we enjoyed a celebratory drink, had a good meal then crashed out for the night. The walk out the next day was very pleasant and included a swim in Coldai lake. We started out from Lake Fedaia taking the Marmolada Seggiovia lift, a somewhat aged system with small metal boxes to stand in, to Rifugio Plan del Fiaconni. 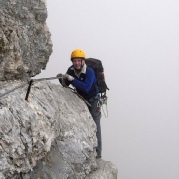 The via ferrata starts at the Forcella Marmaloda gap and to get there involved descending through slabs and glacial moraine before an ascent of a glacier. After clipping into the cables, the route was followed up the West Ridge over a series of ladders and stemples. No where was the route difficult but there was a considerable feeling of exposure towards to top down the huge South Wall of the mountain. 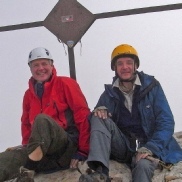 We were joined on the ascent by two English climbers - Paul and Gavin. A zig-zag path lead up the final section of the ridge to the summit where a small rifugio provided a very welcome shelter and hot chocolate. The summit views were broken by the mist but were still very impressive. The route descended eastwards down a protected rock wall and then across the glacier, working our way carefully to the glacier's end. A short walk lead us back to the lift at Rifugio Plan del Fiaconni and the descent back to Lake Fedaia. This was an unforgettable mountaineering day - one to be treasured for a long time and the fitting end to an amazingly wonderful week!